The time honoured tradition of afternoon tea is perfect on a rainy day or to mark a special occasion with loved ones. Tea Day & Time: Thursdays, 2pm-5pm. Reservations Required. Tea Menu: Savory (e.g., tea sandwich, tartine, tart and croquette) scones and other sweets (e.g., creme brulee, custard bars, mousse cake and a parfait). Sample tea menu (changes weekly). We really enjoyed this tea service!! 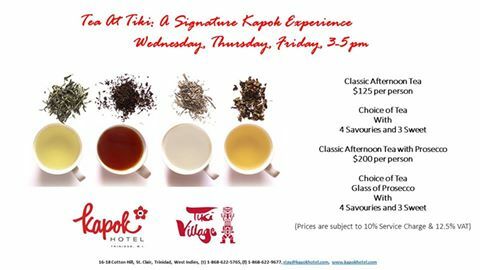 Price: Tea time is $155 + taxes per person. Days & Time: Wednesday & Thursday 3pm-5pm. Reservations Encouraged. Tea service includes tea, 4 savories, 3 sweet items. Coffee is also available. Link to flyer. Day & Time: Wednesday, 4pm – 6pm. Reservations Encouraged. HOUSE OF JAIPUR (Woodbrook, Trinidad; (868) 624-7465) – Take your tea in House of Jaipur’s beautiful tearoom! Days & Time: Tearoom schedule, Tuesday – Saturday, 10:30am-4pm. Reservations Encouraged. Price: Tea and food are available a la carte – prices are available on House of Jaipur’s website. Savoury & Sweet: Indian savouries like dosas, lamb samosas, masala club sandwiches, and a masala vegetable burger (click here for the full Indian savoury menu); Indian sweets are gulab jamun, nan khatai, kulfi, and Indian sweet plate (click here for full Indian sweets menu). Tea Days & Times: Tuesdays to Sundays, 3pm-5pm. Walk-ins are welcomed / Reservations recommended for larger group. Price: Afternoon Tea service is $185 per person exclusive of taxes. Tea Menu: Choose from a range of teas as well as sweet and savory treats. Days & Times: Tea is available Monday – Friday: 7am-5pm with tea starting at 1pm last reservation at 3.30pm; Sat: 8am-5pm with tea starting from around 1pm; Sun: 9am-2pm tea available all day. Reservations encoruaged for large groups and on weekends. Tea Menu: Choose from a range of teas including Dianne’s specialty and premium teas. The Signature Diane menu includes finger sandwiches, scones, canapes, tartlets and cakes. Link to tea menu. ALL MY TEA (Woodbrook, Trinidad) – Co-located with D’ Rite Stuff on De Verteuil Street. Days & Times: Tea is available Mondays to Saturdays 9am-5pm. Tea Menu: Features 35+ loose teas varieties available by bag or cup, specialty coffees, s such as muffins, cookies, scones, salads, and sandwiches. Days & Times: Tea is available Tuesdays to Fridays 9am-5pm; Saturdays 8am-5pm with breakfast from 8am-11am; and Sundays 8am-1pm with breakfast from 8am-11am. Tea Menu: Choose from a range of teas and a la carte pastries (sweet and savory). Ortinola is probably Trinidad’s most scenic and relaxing place for tea. The flora and fauna of Ortinola’s beautiful grounds actually inspired local artist Sarah Beckett’s recent work, Ortinola Variations. Price: Tea is $175/person inclusive of service charge & VAT (children $100/person inclusive) – Tea & Juice or Tea & Coffee served with 4 savories and 3 sweet. Savoury & Sweet Sample Menu – Accra with Melongene; Vegetarian Samosas; Spinach Quiche; Quiche Lorraine; Open-Faced Chicken Salad Sandwich; Smoked Salmon w/Cream Cheese in Filo; Mini-Croissants w/Cheese Filling; Carrot Cake; Fruit Cup; Cheesecake Brownie; Sponge Cake w/Guava Jam Filling; Eclairs. Note: Email info@ortinola.com to be added to Ortinola’s tea service mailing list. Days & Time: Monday – Sunday, 3pm – 6pm. Reservations required 48 hours in advance. Must leave email and contact with them so they can email you the menu and you make your selections. Savoury & Sweet: Sandwiches (cucumber, tuna, ham, and smoked salmon); Savouries (vegetable spring rolls and chicken & herb puff); Sweets (chocolate torte and cherry cheesecake); Scones (ham, cranberry and English cream), along with butter, creams and jams. Price: $205/person inclusive of taxes, Kids under 4 are free, ages 5 – 12 half price. 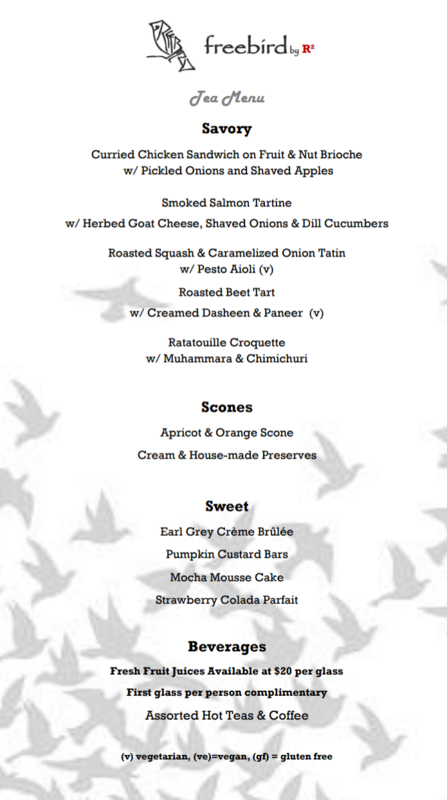 Days & Time: Monday – Sunday, 3pm – 5:30pm reservations recommended. More of a coffee drinker? Check out our five great coffee spots in the West (Trinidad)! NOTE: Every effort is made to keep this list updated, but please call to confirm tea days and times, menus and prices. All tea services, menus and prices as well as the days and times are subject to being withdrawn or changed at the restaurant’s discretion.